How it happened: Indiana’s free fall continued on Sunday afternoon and its limited NCAA tournament hopes were dashed with a fourth straight home loss. The Hoosiers once again started slow and played from behind for most of the afternoon. Unlike some of the other opponents that have marched into Assembly Hall and left victorious, Ohio State never pulled away. And when Indiana grabbed a 52-49 lead with 1:46 remaining, it looked as if the Hoosiers might be able to prevail in a contest they had no business winning. But after Devonte Green’s 3-pointer gave IU the 3-point lead, the Buckeyes had answers the rest of the way. A CJ Jackson heave tied it at 52 with 1:11 left and after Indiana turned it over on the ensuing possession, Andre Wesson’s dunk with 20 seconds to go sealed the win for the Buckeyes. Standout performers: Romeo Langford’s team-high 15 points came on a 6-for-13 shooting line and Devonte Green was solid off the bench with 10 points. Juwan Morgan only scored three points, but grabbed a career-high 14 rebounds. 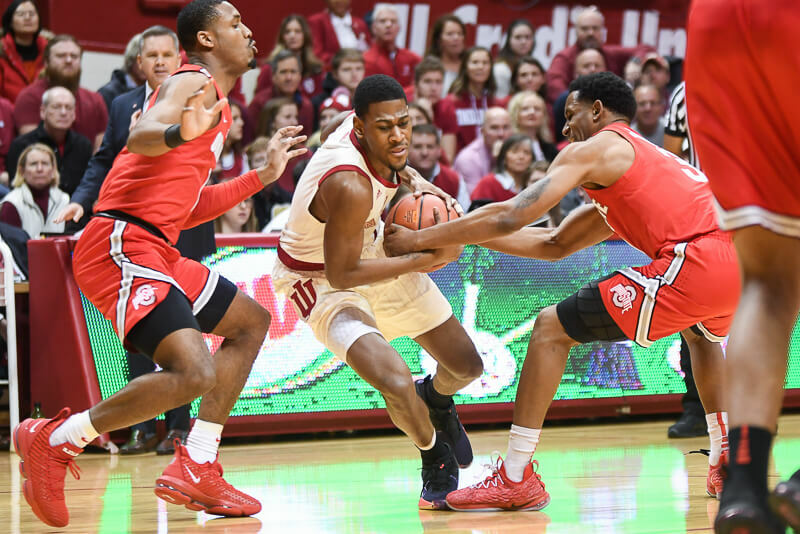 Statistic that stands out: It was another poor offensive performance for the Hoosiers as they shot just 39.6 percent from the field and scored just .88 points per possession.